After a decade of composing and performing around the country largely under the radar, in 2015 a viral Facebook video of his song “Butter II” introduced his music to over 6 million listeners around the world in the course of a month. In addition to a record deal and endorsements with companies such as Ovation guitars and Boss pedals, 2016 provided extensive touring opportunities throughout Europe and the United States, including two performances with a full symphony orchestra. Fingerstyle legend Don Ross invited Case to open for him in Ross’ then-hometown of Toronto, later describing his performance as “some of the most massively inventive musicianship I’ve ever heard/seen.” Other listeners have described his music as a cross between Michael Hedges and Pat Metheny. Joining Ian will be percussionist and recent Berklee College of Music graduate Daniel Feldman. Originally from Mexico and having also lived in the Middle East, Feldman’s unique background has contributed to a rare mastery of both Latin and Arabic percussion, all fused with a creative, borderless approach to music. 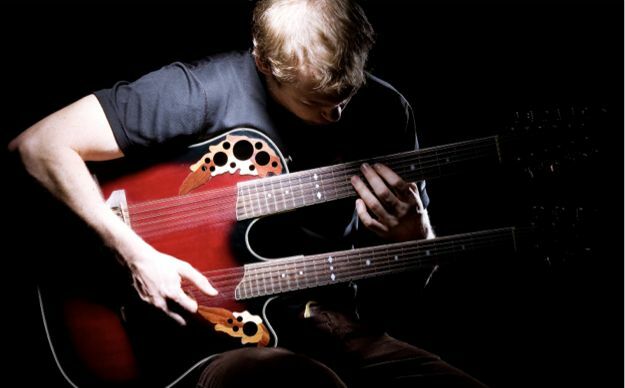 Arizona’s Stefan Kostaras is a 22 year old visionary, weaving intricate soundscapes using only the acoustic guitar. His songwriting has a distinct, relaxed energy about it, breathing a fresh wind into the world with a unique power to soothe souls. While his melodies may bring easy listening to new heights, his technical play-style offers infinite details for discerning listeners.